I spent part of the day renaming files and changing my mind repeatedly about a couple of my file naming conventions. I couldn’t decide if I was happy with the lower case and hyphens for my image names or not. In the end, I went with not, and renamed all my image files with the same case I’m using for the rest. I actually did this a couple of times—back and forth. I also couldn’t decide if I wanted to name my old files “old1” “old2” or “ver1” “ver2” and then I couldn’t decide if I liked using “Cover” in my cover image file names. I decided not. Basically, just a bunch of second guessing of stuff that doesn’t matter at all. I have a sneaking suspicion that perfectionism has found a way to slip in and I’m going to have to do something about it. During the process of navigating through every folder in my writing directory, I came across some fiction I wrote back in 1994–1996. 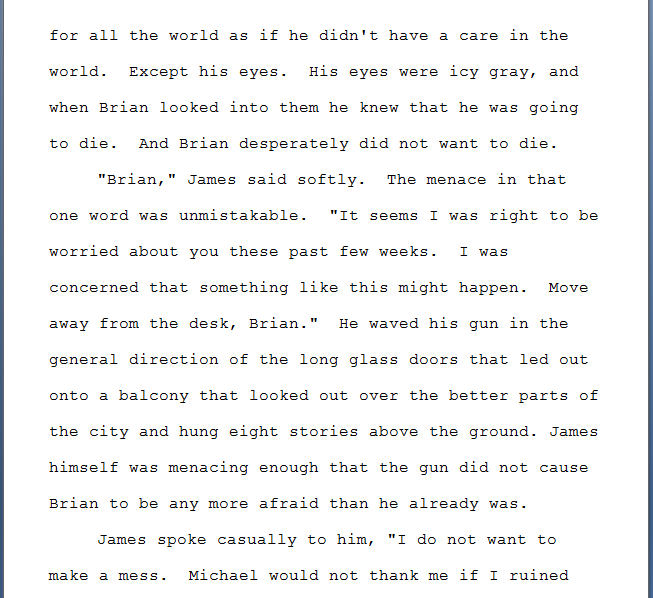 Here’s a screenshot of a bit of one of the stories. I thought those old versions of that particular book had been lost, but apparently I’ve been bringing them along with me in my writing folder with every migration to a new computer. They’re buried deep, but they’re there. After that bit of nostalgia, I found myself sorting and deleting email and trying to come up with a better system for handling my archives. I spent a lot of time on that and all I really decided was that there wasn’t a better system. I deleted some junk, saved a few files and deleted some non-junk, and got the number of emails in my email archive below 5,000. :) That’s over multiple accounts, with my primary account making up about half that with 2,273 emails according to Thunderbird. I also started reading a new book today. The thing is, I knew as it was happening that what I was doing was a mistake. I just couldn’t stop myself. Frankly, it felt a little compulsive. On the other hand, I feel like maybe I’m done now. I hope so. I really don’t want to rename any more files. It’s making me crazy. Tomorrow, I won’t let this happen. But today? There’s no way to deny it. I failed to be a writer today.